Pen, ink, wash and gouache on paper. Caricature of Ernie Mayne from the fourth album that the commercial artist George Cooke used for his caricatures of music hall and variety performers. 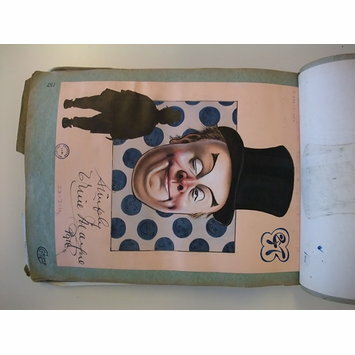 It contains caricatures drawn from 1910 to 1919. Originally from Yorkshire, George Cooke specialised in designing illustrated publicity material for performers. These included flyers, letterheads, posters and newspaper advertisements. He was based at the Grand Theatre for several years. The theatre was designed by Frank Matcham and opened in 1894. Cooke later moved to Blackpool, where he drew performers at the Palace Theatre. Phil Ray says my work’s too good for Hanley; I ought to be in London. But I want money to start with. Who’ll give me some! Griff can’t afford now he’s two families to keep. But he wishes me luck. Many thanks, old friend. GEORGE COOKE, Caricaturist, Hanley. Phil Ray and Griff were both performers whose caricatures feature in Cooke’s albums. 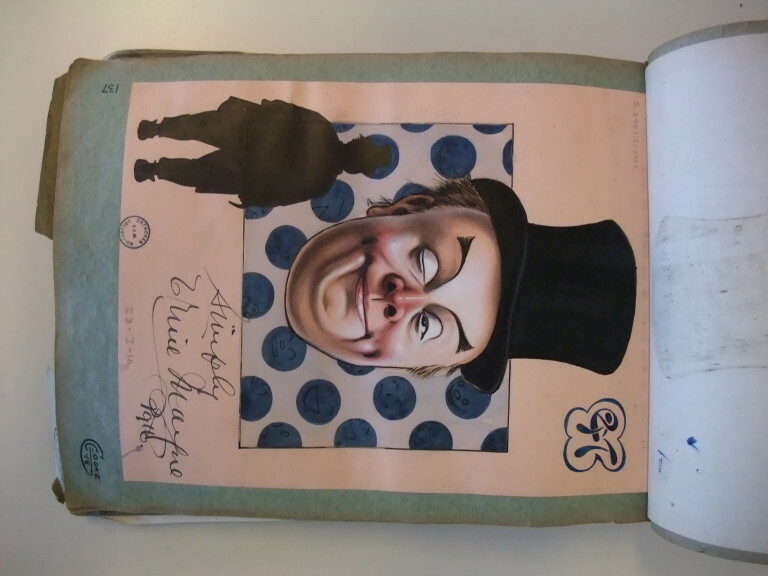 Pen, ink and wash caricature of the music hall performer Ernie Mayne, winking, against a dark blue dotted background, a full-length silhouette portrait of him bottom left. Written in ink on front of page. Caricature of the music hall performer Ernie Mayne, March 1916, by George Cooke.